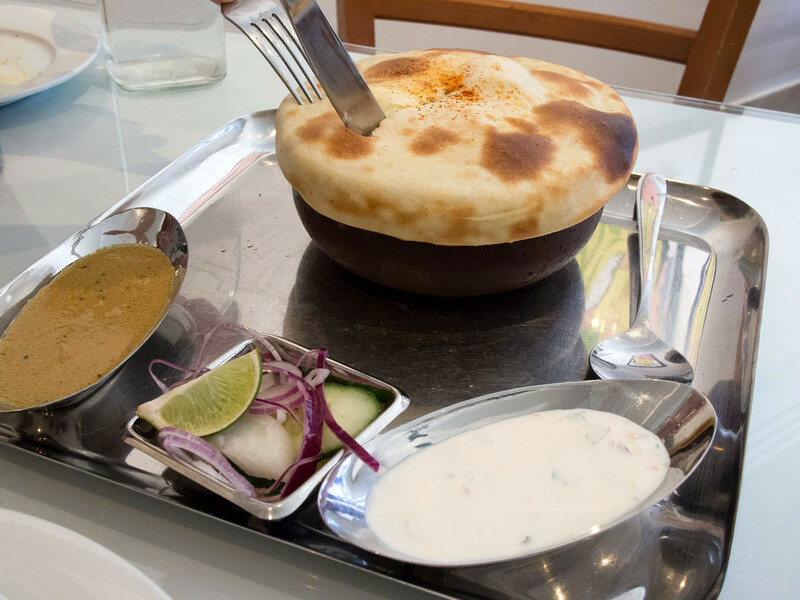 If you're over Five Dock way, look out for the smiling lentil pancake guiding you toward some fine Indian food. Downtown Five Dock is an interesting strip. 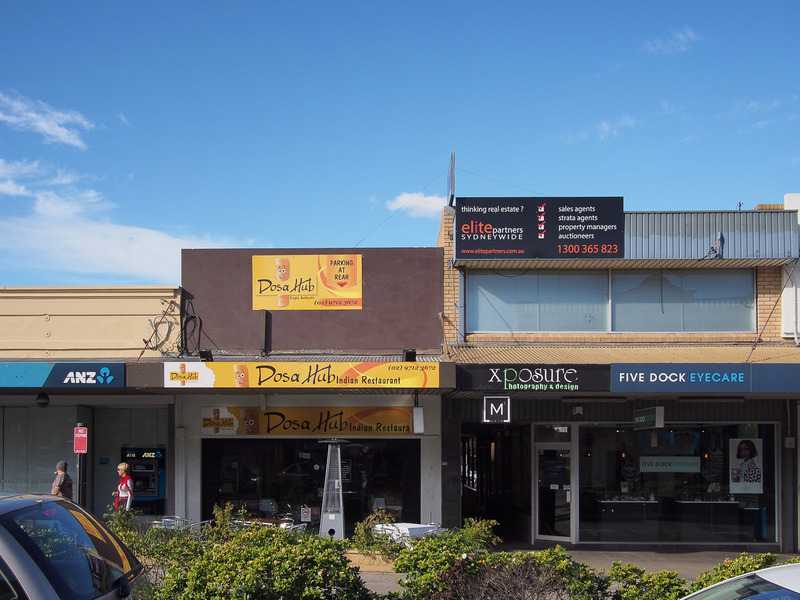 There's a big RSL, hot bread shops (we'll be exploring those later) and all the trappings of a usual suburban shopping street along Great Northern Road. 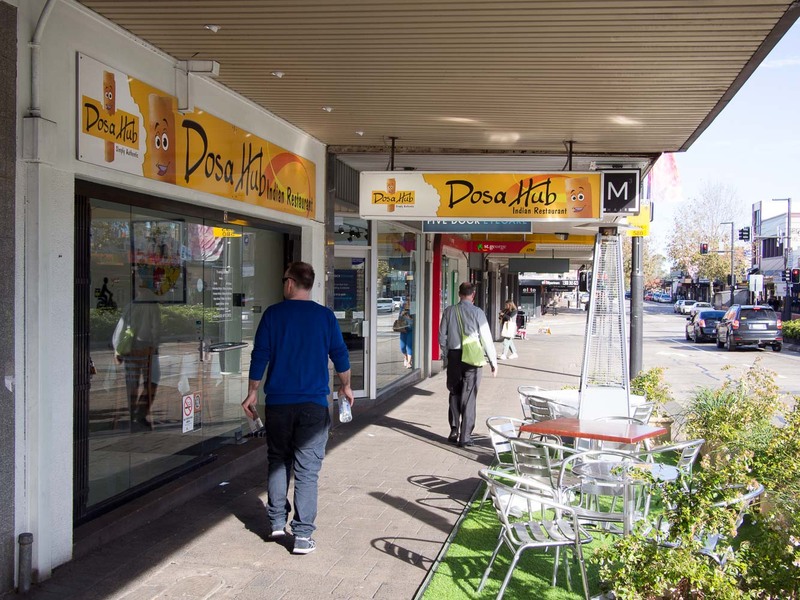 In the middle is Dosa Hub, welcoming you with a bright smiling cartoon dosa. How can you resist anthropomorphic food signs? At fist we hesitate before going in - tablecloths? What sort of fancy place is this? 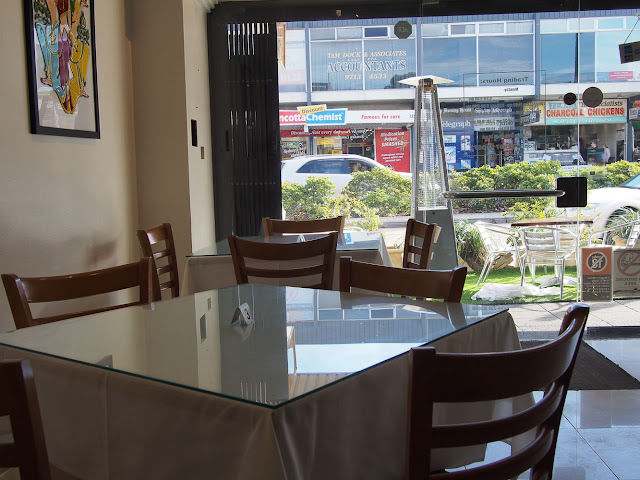 Never fear, it's not too fancy, at night this place gets packed with locals and in the know Indian food fans but we hit it up in the day when all the schmancy looks a little too much for lunchtime. The menu is huge, plenty of curries with colourful descriptions like railway mutton curry, military chicken curry and all those favourites. (Yes, you know you secretly love butter chicken, admit it. We do too.) There's tiffin snacks of fried breads and idli and sweet carrot halwa for dessert. Too much for one lunch to cover. Masala dosa - $13.90. The list of dosa available is a couple of pages long, but we choose the classic masala dosa filled with spiced potato. This version comes with cooling yoghurts mixed with coconut, peanut butter and spices, and a thin chutney similar to the type you get with breakfast roti. If you've never tried peanut butter mixed into yoghurt, do it now. We'll wait for you to get back. Lovely mushy potato innards are held in by a crisp lentil pancake. 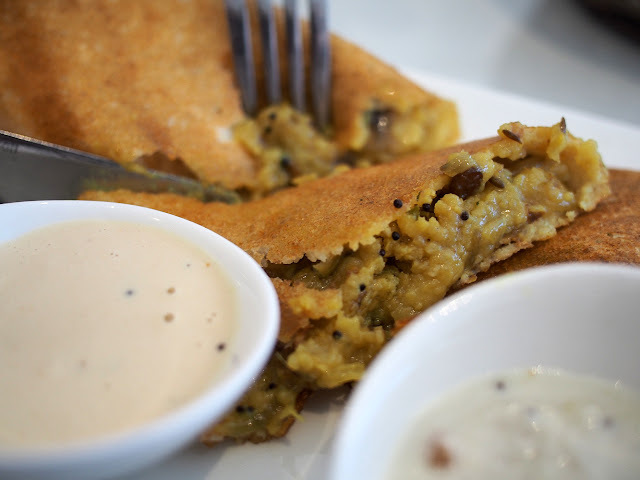 Dosa is made with a fermented lentil flour batter, cooked on a large hotplate until delicate and crisp on the outside and then filled and rolled. The beauty of it is the end parts you can pull off and dip into the different sauces, while the filling in the middle gives you some weight and substance. 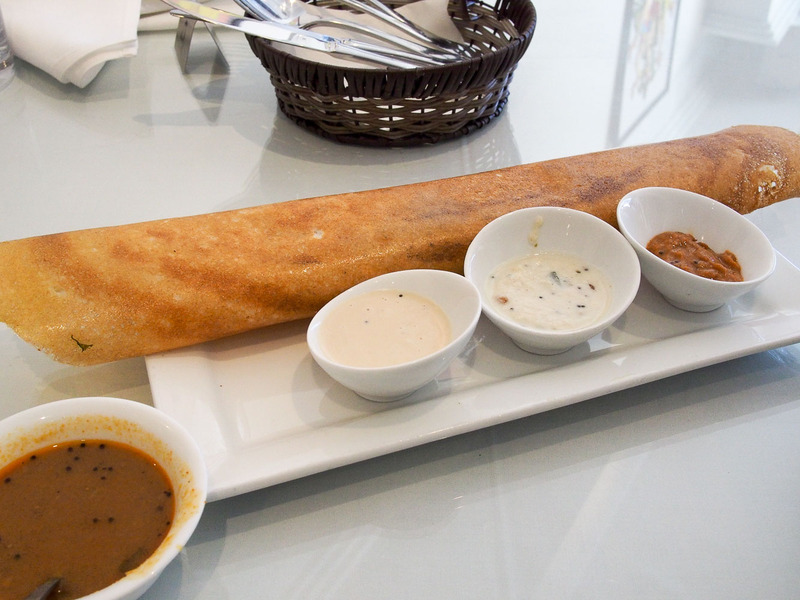 You can order unfilled dosa if you want more pancake, even a foot long one to share across a few people. 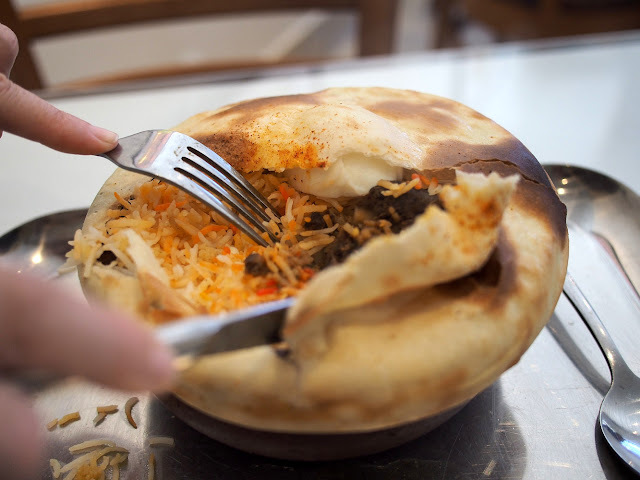 Mr pot parda mutton dum biryani - $17.90. We have a slight infatuation with biryani at the moment which is what led us to Dosa Hub after their version was recommended. 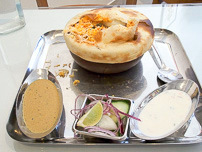 The dum biryani is Hyderabadi in origin, and is different by the way the rice and meat is steamed together under a blanket of flour dough. Once you pull apart the baked dough top, the clay pot reveals fine and fluffy basmati rice, stewed goat pieces and half boiled eggs. You can eat the dough as well, use it to scoop up piles of rice and meat mixed with the raita and supplemented with red onion slices and fresh lime. There's a family sized version for around $32 which would feed an army, we went for the small version and it was plenty for two. We waddle home via the Hunstbury Hotel in Petersham, highly recommended to lovers of old school pubs. 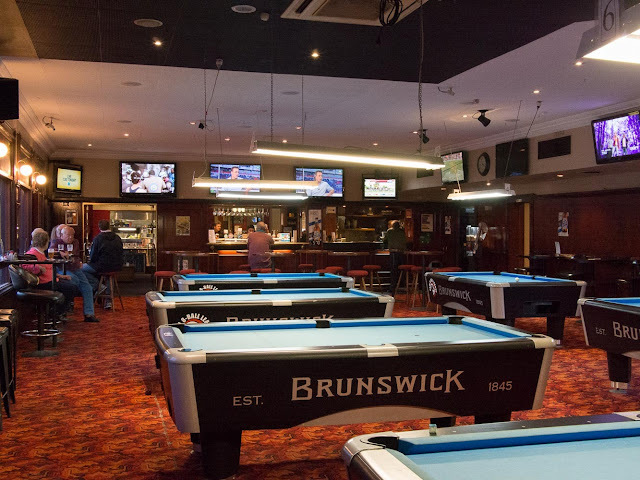 It's still got it's circa 1970's makeover decor and battlers galore. The bistro looked pretty good, especially the Indian nights. Also checkout the little photo exhibition featuring long time regulars and the framed Barry Crocker album. Great blog. Took up your recommendation and paid them a visit last night. Bloody brilliant! Glad you liked it. We're looking forward to trying some of the curries and sweets next time. A work colleague also told me its her favourite for Hyderabadi food, just like home. She travels from down south just to go there. I love the Dosa here! The smiling Dosa guy is great.